An ELF Model 60TT 5 foot diameter stainless steel turntable accumulating disc, pack-on disc, pack-off disc, for food packaging line container handling applications. Food grade stainless steel disk-top, stainless steel base / cabinet, with tubular stainless steel frame and legs. Underside wood disk-backing for strength, complimented by load-bearing trunnions e.g. for heavy, full / glass containers. Presently set at a 32 inch working height on on locking rolling casters for portability. Complete with adjustable 2-bar stainless steel guide rails with plastic runner inserts, for accumulation of, jars, cans, bottles, trays, cartons, tubs, or buckets. Complete with variable speed controller for gearmotor drive, 110 volt single phase electrical input (standard household current). As of this writing, this 5 foot diameter pack-on / pack-off disk is in stock at Alard, in EXCELLENT operational, mechanical electrical, and cosmetic condition, available for immediate shipment. 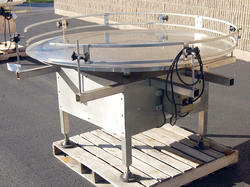 CALL 315-589-4511 to confirm availability, and to discuss your particular food pakcaging equipment needs. This page contains a single entry by Michael C. Shults, Alard Equipment Corp published on December 7, 2018 1:48 PM. 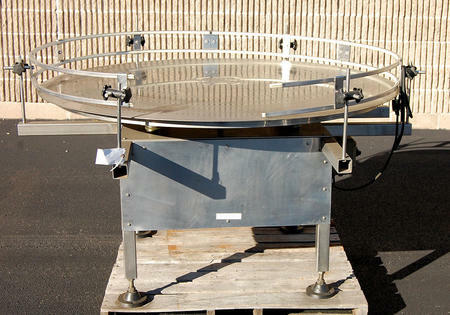 ROTARY ACCUMULATION TURNTABLE, 5 foot diameter, stainless steel, Y3036 was the previous entry in this blog. ELEVATING CONVEYOR, cleated belt, food grade, stainless steel, 12x8, Y4030 is the next entry in this blog.